Demirkari is a residential area at the surroundings of an old silk factory, placed at the outskirts of the mountain Uludağ. As an introduction we should mention some of the qualities that we observed at the area. Firstly, in the neighborhood coexist two different groups of people, Roma and Turkish, and both of them have a relation with the tradition of their culture. It is also remarkable that they have a strong connection with the street, where all they daily habits and their socialization is taking place. The above fact and also the low, old houses, the human scale, the “closed” community and the existence of many empty green spaces are factors that preserve a scale of a village at the area. Furthermore, another feature that defines the area is the “boundaries” that set the old houses at the narrow streets and the wall that surrounds the factory. This “boundaries” serve as a scene and create a certain atmosphere. Our idea is based on these qualities and the effort to preserve them. We noticed that the silk factory was a meeting point for the two different groups of people and we have the intention to restore such a place. In order to do that we create a community center at the area of the old factory for the interaction of the two cultures. We propose that this center hosts a school for adults, workshops, cultural, musical and theatrical activities, craftworks and activities for children. We also focus on the surroundings of the factory and make some suggestions for the improvement of the neighborhood. We take advantage of the empty and green areas to create spaces that people can use for their daily habits, as an extension of the street, and create several paths that help the inhabitants to use these places, that we call “street corners”. We do not ignore the fact that the neighborhood is in the bottom of the mountain and the slope provides nice view and visual connection with the city and the mountain, so we attempt to use these spots in the above network of paths and empty spaces. Furthermore, we put some functions on a lower part of the neighborhood that provide the connection with other neighborhoods, such as a bazaar area. With this action, we intent to have a gradual transition from local character to a more urban environment. Ultimately, we suggest the conservation of the old heritage, such as the houses and the wall, with the participation of the community and the connection of this action with the activities of the community center. 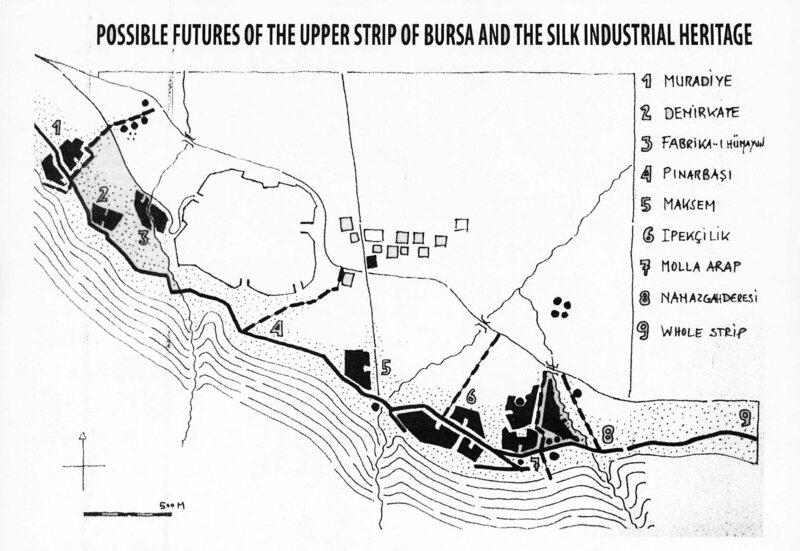 The aim of the project was a proposal concerning the future development of Bursa on the outskirts of Uludag and what would become of the remaining silk industries located in the area. In order to do so, at first, we tried to specify the qualities of the place. We found out that the whole city and especially our area of study were deeply connected both to the green element and the essence of water. Afterwards we tried to locate and predict the changes that will affect the place in the near future. We observed that the old silk factory was about to be converted into a design school. So in our proposal we took that conversion for granted and tried to maintain the values mentioned before throughout the rapid changes that were about to come. So we tried to control the urban spread without suppressing the green element, we suggested imposing rules concerning the land values in order to prevent overpricing of the lands, now inhabited by low - income families. Last but not least we tried to connect the outskirts with the city center via pedestrian pathways spanning across next to the river as we found out that water is a vital element to the place from its birth until now. The area is currently divided into a military zone, the museum-park border and the abandoned silk factory border between the first two. Our objectives are, first of all, to create connections between the two existing parks and to connect the whole site with the Uludag mountain, to remove border buildings, to pedestrianize streets. The ancient silk factory will be converted to a handcrafts center and the military area to a sport complex. As for the neighbourhood, our aim is mixity, by joining the children and the elderly people and the creation of a few mobility bus stops, an easy access for tourists to the recreation and sports areas. In general, we propose for the district: a cultural area which consists of the existing car museum, a handcrafts workshop and a multipurpose hall.